I accompanied the Sea World rep in the module to film the emergency application video recently released. Watching it brought back a lot of memories. Yes, the module was small and Tillikum was large but imagine three whales living in that module. Now imagine a calf in the module as well. Sealand was one of the only sea pen structures publicly displaying Orcas. In my opinion, it was in fact was one of the best environments for killer whales, module included. The sea pens allowed a multiple of life enter into the orcas display. The whales use to herd and fish the plentiful bait that entered annually into their pool. Brave local seals periodically would sneak into the pens and cause quite a commotion as the whales would tear after them. Nootka especially liked to drape river otter pelts and bird wings on her head. They were wild whales and they acted wild. The module was a necessary extension of the pen as it was the medical area. One cannot drain a sea pen. A way to manage the whales for medical purposes needed to be incorporated. The module was a floating steel structure with a liftable floor in it. Designed to hold and raise the three killer whales completely out of the water for medical treatment and health assessments. It was designed to be a secure housing area after the death of Miracle who died in a hole cut into the nets of the sea pen, either by the whales themselves or an individual trying to release them. When I first started at Sealand, every evening all three of the killer whales would be put into the module to be secured for the night. Coming from a farming background this at the time seemed similar in nature as putting cows back into the barn or horses into their stalls. The whales would go in, finish their daily food intake and let out back in the morning, with little or no difficulty. Months later breeding activity intensified and the whales started to refuse to enter the module. At first simple deployment of the net in the main sea pen would work to put the whales into the module. Then the whales started to learn to lift up the net and what used to take a simple hand command ended up in a long extensive project deploying and redeploying the nets. We consulted with the owner of the park and shared with him our concern on continuing housing all three whales in the module. One, because of the difficulty of putting them in but more importantly we could see the social relations intensifying between the animals. This was due to the fact that the two females were pregnant. Being able to breed animals is used by many captive facilities as a sign that their operations are working. So despite all three whales being "locked-up" in the module nightly for years, the pod of three successfully bred. 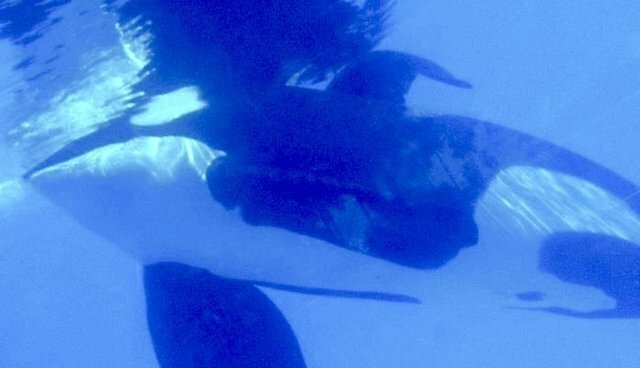 The owner agreed to allow us to put only Tilikum at night with the theory the females would stick around if they somehow escaped from the main sea pen. In my mind, it was a good start as one in the module at night was better than three. Haida gave birth first to a male that is known now as Kyuquot housed at SeaWorld in Texas. During this time I was training the animals during the day and accompanied my girlfriend who was getting paid for night observation. It was amazing to see this healthy calf develop. Shortly thereafter Nootka gave birth and right from the start you could tell the calf was not nearly as healthy or vivacious as Kyuquot. When Nootka passed her placenta, it had two birth sacs which would have been developed by twins. Shortly after birth, Nootka (in my opinion) deliberately tried to push the calf to the bottom of the pool. It appeared to be that she recognized something was wrong and simply was trying to drown her calf. To this day, I wonder what her intentions were but in the end her calf died. During the two births, Tillikum spent a lot of time in the module. Due to the size of the pool, this was beneficial as it allowed Haida to have more room in the sea pen to nurse. I remember many times when the module was open and Tillikum would get chased back into it by Haida. As the matriarch, she controlled the pool and it was obvious she wanted Tillikum away from herself and the calf. Throughout this, the whales had been sold to SeaWorld. For certain, the extensive time Tillikum spent in the module was not ideal. From an animal management perspective, it seemed appropriate to apply for an emergency permit to accelerate the transport permit of Tillikum. Thus the video of the size and conditions of Tillikum were taken to prove to the permit people that this situation was not ideal. The political world of permits makes it impossible to know when or if a permit for transport will be approved. During the process the module gate was open daily to give Tilikum a chance to integrate with the other animals. At first he would simply do small circles in the main pen and quickly retreat back to the module. Slowly over time it was getting obvious that Haida was less and less concerned with Tilikum. Always being opinionated I started bringing up the concern that Tilikum was getting more and more confident to join the pod and if the permit to transport came through it would be difficult to get him back in the module after such a long duration of not being with the others. I was advised by SeaWorld experts I was thinking too much and it would be ok. Sure enough Tilikum was accepted back into the group and swam happily with his son and pod members. Finally the permit approval came through and we had to get Tilikum back into the module to prepare the transport. The lure of food was not good enough for Tilikum who choose to want to spend time with the others and refused to enter. With a plane arriving to pick up Tilikum and hundreds of thousands of dollars at stake something had to be done. The only resort left was to try to net him into the module. It was believed that the calf would follow Haida into the module. Haida being so aware of her surroundings would see we were going to the close the gate and we theorized when she exited the module her calf would be with her and Tilikum would remain able to be isolated since he was always the last one in and the last one to leave the module. We put the net in and dragged it to push all of the animals into the module. Sure enough Haida seeing me on top of the gate of the module broke out back into the pool with Nootka right behind her. During this turbulent time we had only a brief window to close the gate on Tilikum before he also broke out back into the main pool. I lowered the gate and we were all stunned to see the calf had not in fact followed Haida and was left alone in the module with Tilikum. Tilikum aware of what was happening was not happy and started quickly vocalizing loudly and agitated. For the safety of the calf we had to quickly raise the module floor to beach both animals. Tilikum was upset and aggressively thrashed at everything including the calf. Fortunately our adrenaline raised the floor with the hand cranks the fastest it had ever been lifted and we beached Kyuquot and Tilikum. A sling was deployed and after quick check we carried the calf back to the pool. The distressed calls of Kyuquot were loud and deliberate. Amazingly the entire procedure turned out alright and Tilikum was now in the module to be transported to Sea World and the calf was back with his mom. That is how Tilikum got to say goodbye to his son and his pod. Yes, it sucked. Years later, 2004, Kyuquot was involved in a dramatic attack on one of his trainers at Sea World. To this day I always believed that his memory of his first encounter with humans at our darkest in that module contributed to that attack. Maybe I am wrong. But for whatever reason we must take the responsibility that management of these large animals has extreme consequences. As I say in "Blackfish," these animals do not attack due to being crazy; they attack just like any human would when their patience with being suppressed breaks. So in the end I hope you see that moving animals to larger or bigger tanks does not make things right. The sea pen of Sealand kept the whales invigorated and confident. They maintained their teeth, they maintained their pod and they maintained their lifecycle. To say bigger will be better is like saying a Super Gulp is better than a Big Gulp. Soda is soda and more of it actually can cause you harm. A bigger pool will not be more harmful to the animals but it definitely will not solve the issue of the animals, their lack of choice and control of their environment. Sea World, let's stop with the cement, let's stop with the justification. Let's give Tilikum, Kyuquot and all the animals a better life and spend 10 million on a sea pen and the hundreds of millions you are going to spend on cement on killer whale research. Only then can the animals' sacrifice will finally do the action needed in the wild that all our education and awareness has neglected for fifty years.